School experienced dry, warm weather except on Friday night when Bali experienced heavy showers. Sky was overcast with stratus clouds on Saturday and Sunday. Temperature fell 5°C in the last week. Evenings and nights were cooler and pleasant. Dusty winds blew and developed a low pressure around North Western India. World Ozone day is celebrated every year on 16th September since 1995. In 1985 the Vienna Convention established mechanisms for international co-operation in search into the ozone layer and the effects of ozone depleting chemicals (ODCs). 1985 also marked the first discovery of the Antarctic ozone hole. On the basis of Vienna Convention, the Montreal Protocol on substances that deplete the ozone layer was negotiated and signed by 24 countries and by the European Economic community in September 1987. The protocol called for the Parties to phase down the uses of CFCs, halons and other man –made ODCs. After a series of rigorous meetings and negotiations, the Montreal Protocol on substances that deplete the ozone layer was finally agreed upon on 16th September 1987 at the Headquarters of the International Civil Aviation Organization in Montreal. Monday, 13th September: DEAR program was conducted as usual. School has begun to follow the new format for Assembly prescribed by CBSE. The whole week Assembly was conducted by Gandhi House. Command was given by Divanshu Bhati/X/GH. Pooja Dutta/XI/GH presented Thought for the Day. Kritika Mansion/X/GH read the news; Siddhi Vyas/V/GH recited a poem and Khushi Rao/X/GH got the school to say the school pledge. Tuesday, 14th September: Principal announced that the passing percentage in exams from now on will be 40% instead of 33 %. She encouraged students to raise their level of performance so that they gain in raising their own levels of performance. 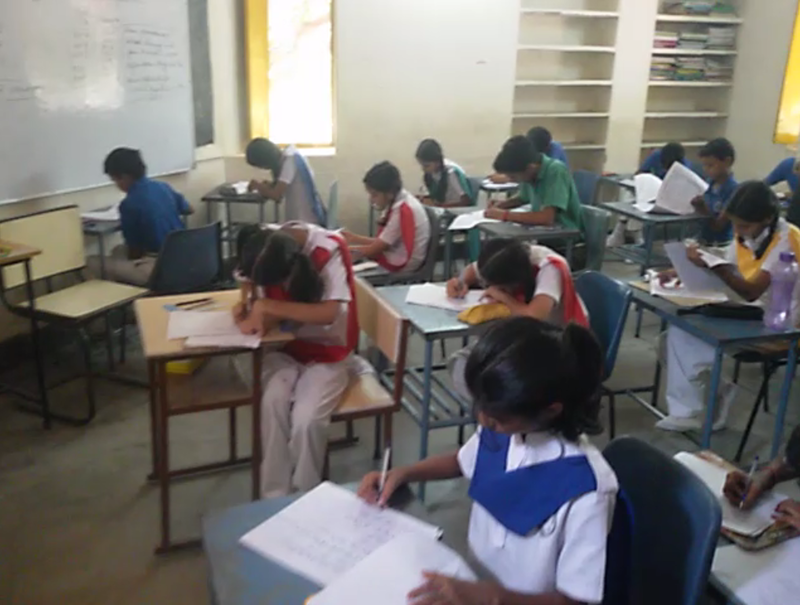 In many classes revision tests were conducted. On the occasion of Hindi Divas, a Special Assembly was organized. Mr. K.G Dave/HOD/Hindi: Made students aware about Hindi and its importance..
Nikhil Soni/X/TH: Spoke on the importance of Hindi in foreign countries. Kreena Rao/DH/VII: Spoke on the benefits we gain from Hindi language. Wednesday, 15th September: Gandhi House conducted the Assembly. Commands were given by Anirudh Singh/X/GH. Khushi Rao/X/GH read the news. Anumesh Rao/VII/GH presented Thought for the Day. Pooja Dutta/XI/GH organized G.K Quiz. All the students seemed busy in their studies due to forth coming SA I. Revisions were in full swing. World’s Ozone Day Special Assembly was organized. Mr.Byju Joseph/AD/HOD Science: Spoke about Ozone layer and how it is getting depleted. The ozone layer is a vital component in the history of life on Earth. Hundred million years ago only single cell organisms existed on earth and at the same time the planet lacked the oxygen that we need. to live. But as these organisms evolved they began to release tiny amounts of oxygen through photosynthesis, over a period of years led to the creation of the ozone layer. However, Schombein was one of the first people to suggest that higher concentration of ozone at ground level could affect peoples’ health. Jean-Luis Soret in 1860 was able to describe the molecular structure of Ozone. Muskan Rathod/IX/TH: Spoke about Ozone and its uses. In 1994 the UN General Assembly proclaimed 16th September as the International Day for the preservation of the ozone layer. All were invited to devote the Day to promote the activities in accordance with the objectives of the Montreal Protocol passed in 1989.We should control the uses of those substances which deplete the Ozone layer. The ozone layer protects human health, ecosystem, climatic changes, etc. limiting the harmful ultra violet radiations from reaching the earth. This year marks the 30th Anniversary of the Vienna Convection for the protection of the Ozone layer. Scientific evidence indicates that stratospheric ozone is being destroyed by a group of manufactured chemicals, containing chlorine and/or bromine. These chemicals are called "ozone-depleting substances". They are very stable, nontoxic and environmentally safe in the lower atmosphere, which is why they became so popular in the first place. However, their very stability allows them to float up, intact, to the stratosphere. Once there, they are broken apart by the intense ultraviolet light, releasing chlorine and bromine. Chlorine and bromine demolish ozone at an alarming rate, by stripping an atom from the ozone molecule. A single molecule of chlorine can break apart thousands of molecules of ozone. The main components of depletion are chlorofluorocarbons (CFCs), hydrochlorofluorcarbons (HCFCs), carbon tetrachloride and methyl chloroform. Halons (brominated fluorocarbons) also play a large role. Their application is quite limited: they're used in specialized fire extinguishers. But the problem with halons is they can destroy up to 10 times as much ozone as CFCs can. For this reason, halons are the most serious ozone-depleting group of chemicals emitted in British Columbia. Uttam Suthar/X/GH: Spoke about the importance of Ozone layer. Ozone is a gas in the atmosphere that protects everything living on the Earth from harmful ultraviolet rays from the Sun. Without the layer of ozone in the atmosphere, it would be very difficult for anything to survive on the surface. Plants cannot live and grow in heavy ultraviolet radiation, nor can the plankton that serve as food for most of the ocean life. The ozone layer acts as a shield to absorb the UV rays, and keep them from doing damage at the Earth's surface. The ozone layer occurring naturally in the lower layers of the atmosphere helps remove the pollutants from the surface of the earth. Saturday, 19th September: Summative Assessment I started for Class III to XII. Cycle Tests were conducted for Class I and II. Dry, warm weather has been the order of the week. This year round Rajasthan generally receives rains from returning monsoons but due to dry weather no pressure is getting built. Days have warmer than expected but nights are cool enough to sleep under fans. Lowest temperature recorded 26°C and highest 38°C. Temperature increased by 2°C while humidity fell to 51%. Wind blew at 3km/hr. Saturday, 12th September: Since 5th September was Janamastami holiday, Teacher’s Day was celebrated. In a happy atmosphere the Assembly was conducted by teachers where Mrs. Punita Chauhan spoke the prayer, Mr. Gajendra Singh spoke thought for the day, Ms Priyanka Mahatma read the news and Mrs.. Bharti Rao recited a poem dedicated to her unforgettable teacher. After Assembly students put up a small program for Teachers’ Day Celebrations. Show was anchored by Bajrang Singh/XII/TH and Vaishali Rao/XII/GH. The show started with a speech given by Radhika Singh/X/GH. Song was presented by Mayur Singh/XII/TH, Neeraj Pawar/XII/TH, Pooja Dutta/XI/GH and Khushi Rao/X/GH. Compliments were given to teachers with a token of appreciation. Tanvi Parmar/IX/RH, Priyal Dave/VIII/GH, Hemlata Vaishnav/VIII/GH mesmerized everyone with their beautiful dance performance. Blessy Maria/XI/DH with her mono-acting filled the air with laughter. Soniya Vaishnav/VI/GH, Minaxi Choudhary/VI/TH, Charu Vaishnav/VI/DH, Gayatri Rathod/VI/DH, Harsdhita Kunwar/VI/RH gave a beautiful dance performance. Vinita Sirvi/VI/GH acted as her S.St teacher Mrs. Kusum Sharma. Most talented Khushi Rao/X/GH gave a solo dance performance. Principal invited all teachers to share what they had learnt from their teachers and who was their special inspiration in life. The function ended with a motivating speech by Principal Ms. Deepika Tandon. After the school got over, teachers sang beautiful songs and danced with Class XII students in Principal’s garden followed by refreshments. Thank you Class XII students for organizing such a rewarding program for teachers! Teachers looked thrilled at the attention they received. Students were asked to touch the feet of their favourite teacher and take their blessings. Of this flagship of knowledge. On you the staff and students rely. You are our most wonderful and caring teacher. You have enlighted me all through. To awaken joy in creativity, expression and knowledge. Sometimes your beautiful smile makes us proud. I know that now you don’t teach us but don’t worry we still love you and will always love you. And instilling in me- a love of learning. Kalam ka matlab, aapse hi jaana. An idol of knowledge, experience and inspiration. Smart and attractive Kanik Sir. Helped to make learning fun and cool. And that is what you did for me. You have been my guide and supporter. You encouraged and guided us. Thank you for shaping us for the modern world. Makes you are loving Ma’am. With everything that you shared. Who consumed yourself to light the way for us. In instilling the love of learning Economics. A friend, a guide and inspiration for making us find ourselves. I just want to say ‘Thank You’. For you planted a seed of knowledge that will grow forever. You proved learning can be joyous and pleasant experience. And that purpose I see in you. Bali experienced dry, warm weather with pleasant evenings. The week went by without showers. Days were warmer but evenings and nights were cooler. Lowest temperature was at 24°C and highest at 36°C. Temperature increased by 2°C while humidity fell to 57%. Wind blew at 6km/hr. Monday, 31st August: For this year the school had planned to celebrate the birthdays of the students from Nursery to Class V on the last day of each month. So the birthday of all the students that fell in the month of July and August was celebrated on 31st August in the Junior Campus. The birthday students partied by cutting the cake, dancing and distributing chocolates. But some are blessed with many features. And with their post they are loyal. As teacher is their guide. So they are number one. And show us the way to reach success. Monday, 31st August: The School Football team participated in the 60th District level U17 Football Tournament. The school won the quarter final. In the semi final unfortunately they lost, but yet they were able to secure third position in district. It is a great privilege to announce that Shashank Singh/X/DH and Pradhuman Singh/IX/GH have been selected to play at state level. On 29th August School’s Football Team escorted by Mr. Tarun Mishra went to Sojat to participate in the 60th District Level U17 Football Tournament which was organised by Raj Public School, Sojat Road. First match was played against Govt. Boya School and school team won by 2-0 on 30th August. On 31st August they played against Raj Public School, Sojat and won by 5-0. Now they were qualified to play quarter final where they played against Govt. High Senior Secondary School, Sojat and won by 2-0. They qualified themselves for Semi-Finals, but unfortunately they lost the match against Rajdand by 3-0 on the same day. Next day they played Hard line against Sesali Govt. School and secured 3rd position. Team players were Rajveer Singh Sonigara/X/TH, Dheeraj Bharti/X/RH, Amrit Choudhary/X/RH, Somendra Singh/X/DH, Rajveer Singh Rathore/X/RH, Jay Rawal/X/DH, Priyank Rathod/X/DH, Shashank Singh/X/DH, Sandesh Singh/X/DH, Manish Raika/X/DH, Suryaveer Singh/IX/DH, Maharaj Singh/X/RH, Ravindra Singh/VII/RH, Suryabhan Singh/VIII/TH, Gajendra Singh/VIII/DH, Pradhuman Singh/IX/GH and Yuvraj Singh/VIII/RH. All played extremely competitively and won the hearts of the local students by their excellent performance. Team was disappointed as they could not reach the final, but everyone felt go when Shashank Singh/X/DH and Pradhuman Singh/IX/GH got selected to play at the state level. Thursday, 3rd September: Football team returned. They were awarded certificates by Mrs. Deepika Tandon our Principal and a trophy was awarded for school to the Principal too. A vote of appreciation was given to the players by Mr. Ajay Vijayvargi and Mr. Hitendra S. Chundawat. 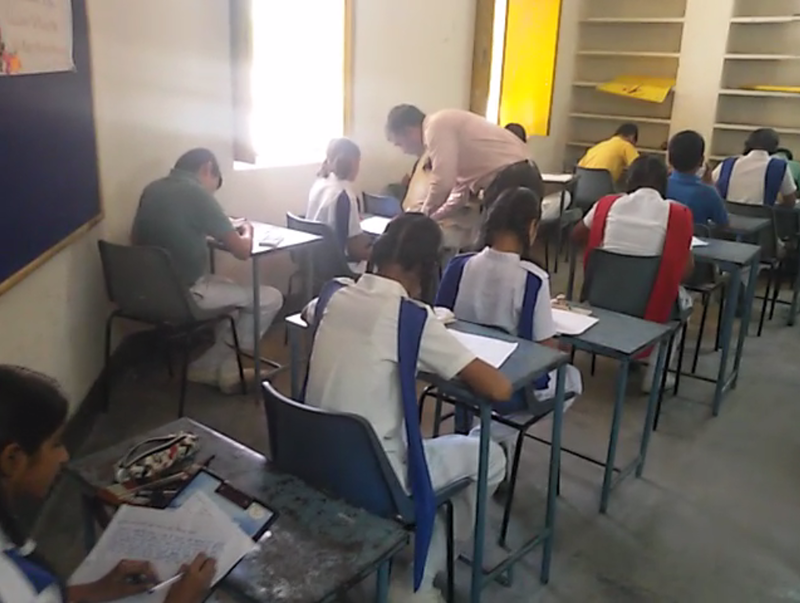 Monday, 31st August: To inculcate quick minds and help students know table, Math Dept started with a series of classes who will volunteer to speak table in Assembly. Therefore Aryan Sirvi/VI/DH spoke tables from 11 to 15. DEAR Program was conducted after the Assembly. Regular classes took place along with Remedial lessons. Tuesday, 1st September: Special Assembly was organised to celebrate Commerce Week. Nattu Kunwar/XII/RH: spoke about Sundar Pichai, CEO of Google. Construction of water hut is complete. Students will begin to drink water from Monday onwards, though chillers will be added a little later. Wednesday, 2nd September: With Commerce Week being observed, more students spoke in Assembly. Vaishali Rao/XII/GH: spoke on Courses of Commerce. Yash Soni/XI/RH: spoke on Charter Accountant. Thursday, 3rd September: On third day of Commerce Week Nayan Soni/XII/TH spoke about money and currency. Ahmed Raza/XI/DH: spoke about Gross Domestic Product and Per Capital Income. Students of Class XI were taken on an Industrial Trip, 2 km ahead of school. The solar plant coming up next door that students went to visit is spread in 330 bigha. Till now 76 biga has been used. Project is at a very large scale. It is collaboration between a private company and the government. The installation cost at Rs.66 crore is embedded and electricity produced per day will be 50, 000 units. In this solar plant about 73 junction boxes, 8 invertors and 4 transformers will be used to convert solar energy which is in dc. In about 1 month the plant will start and will supply electricity in nearby places. The trip was fruitful for students who visited the place.